Madeleine Albright, former Secretary of State, warns capacity crowd about the rise of authoritarianism. During her on-stage discussion at the Kaiser Permanente Arena with Pulitzer Prize-winning reporter Martha Mendoza, (Kresge '88, individual major, journalism and education) Albright drew from global as well as personal history to make the case that fascism remains a virulent threat. 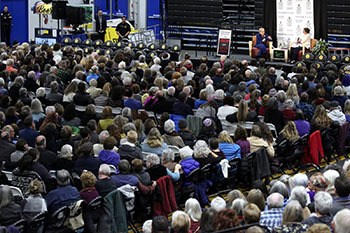 The Madeleine Albright event filled the Kaiser Permanente Arena. 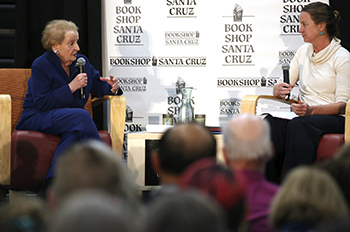 Madeleine Albright, the United States’ first female secretary of state, warned about the rise of authoritarian governments and the enduring threat of fascism during her sold-out talk in front of 2,500 people in downtown Santa Cruz on Tuesday night. Albright recently topped the New York Times bestseller list with her 2018 book, Fascism: A Warning, in which she traces fascism’s roots, calls out the global rise of right-wing authoritarian regimes, and expresses grave concern about divisions, resentments, and isolationism in the United States. During her on-stage discussion at the Kaiser Permanente Arena with Pulitzer Prize-winning reporter Martha Mendoza, (Kresge '88, individual major, journalism and education) Albright drew from global as well as personal history to make the case that fascism remains a virulent threat. “The definition (of) fascist is someone who identifies with one group at the expense of another, thinks the press is the enemy of the people, believes various institutional structures don’t work, and is prepared to use violence to maintain power,’’ said Albright, who served as Secretary of State from 1997 to 2001 under President Bill Clinton. Even when Trump was not mentioned by name, he was a shadow looming over Albright’s discussion with Mendoza. She also urged audiences to be proactive, and engage in respectful dialogue, to counter the polarization and the coarsening of political discourse in the United States. Albright responded with her own vivid story of displacement because of authoritarian regimes. Born Madeleine Jana Korbelová in Prague, she was forced to flee her home country twice – first, because of the Nazi occupation, and later because of the Communist government. She found out that the United States prided and distinguished itself by opening its arms to refugees. 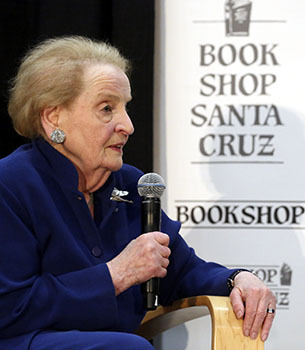 Bookshop Santa Cruz presented the Madeleine Albright event, which was co-sponsored by the Humanities Institute at UC Santa Cruz and Temple Beth El.